The Business Model Canvas and the other canvases that might have been derived from it have become powerful devices for recoding, analyzing and presenting ideas. Enterprise Architect can be used to create these powerful visual devices and the elements on the canvas can be linked to other modeling elements such as goals, capabilities and market analysis models. A Class Diagram can be used to create a Business Model Canvas using a number of Boundary elements that can be juxtaposed with each other to define the sections of the canvas. Classes can be used to add the detail in each section and these can be given names and detailed descriptions. 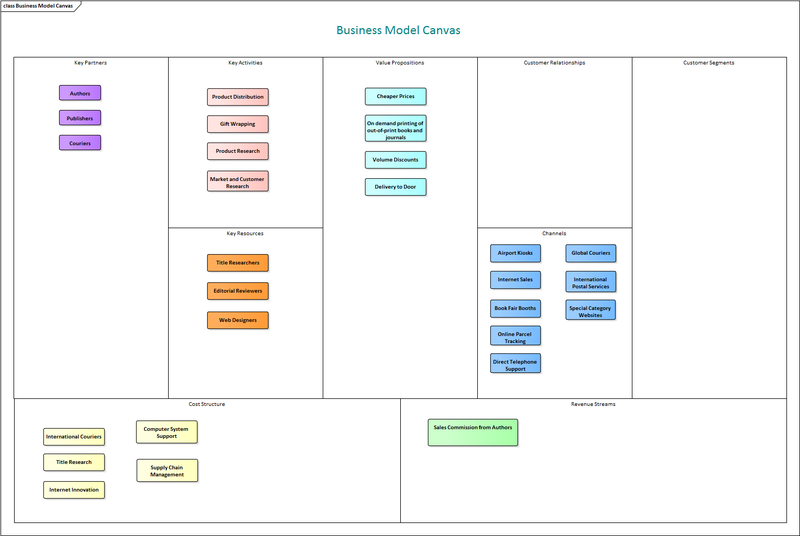 A number of Boundaries can be added and aligned to create the cells for the Business Model Canvas. The Boundary elements can be resized and juxtaposed to each other to create the layout of the canvas. Elements can then be added to represent the content in each section. The appearance of the elements can also be changed to make the diagram more compelling. The appearance of elements can be changed in a number of ways to make the Canvas more compelling this includes changing the fill and border and font colors of the elements and the font style and even replacing the default element presentation with an alternate graphical image.